Psychologists have found that even in a bad state, such as depression or glaucoma (poor condition), when you smile, even a fake smile, you can change your mood. A Smile strengthens your immune system - Smile can really improve your mental condition. When you smile your body becomes relaxed, which contributes to a stronger and healthier immune system. It's not just a saying: the smile is really contagious, scientists say. In a study in Sweden, a person who smiled towards another person, made him smile just by smiling alone! When you smile, your body automatically releases endorphins that make you feel better. Scientists have discovered that frown is much harder than a smile. When you hug, kiss, or just shake hands, a smile will always show the happiness of the person, even if he hurts inside. Babies learn a lot of behaviors and sounds from watching people around them, but scientists believe that all babies are born with the ability because even blind babies smile. Employers tend to promote people who smile often. 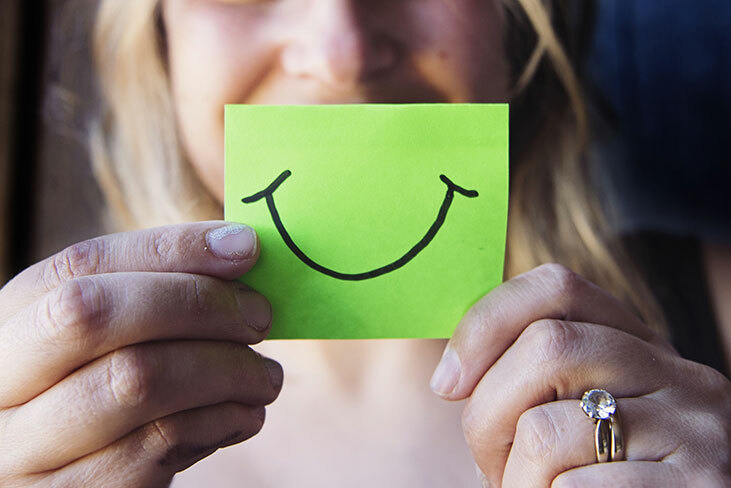 Smiles can make a person look more attractive, sociable and confident, and people who smile more are more likely to get promoted at work, or even in life. People can recognize smiles from up to 300 meters away, making the expression easy to identify. In general, women smile more than men, but when they share similar work or social roles, they smile as much. A study by Orbit (yes, the brush/toothbrush company) found that 69% of people find women more attractive when they smile than they wear makeup. There are 19 different types of smiles - a San Francisco researcher identified 19 types of smiles and defined them into two categories: "social" polite smiles that deal with less muscle, and "felt" smiles that use more muscles on both sides of the face.